FORT WORTH, Texas — The crowd was three people deep inside W.R. Watt Arena. Every seat was filled. People leaned against walls, crouched over railings and stood on their tippy toes just to catch a glimpse of the show below. 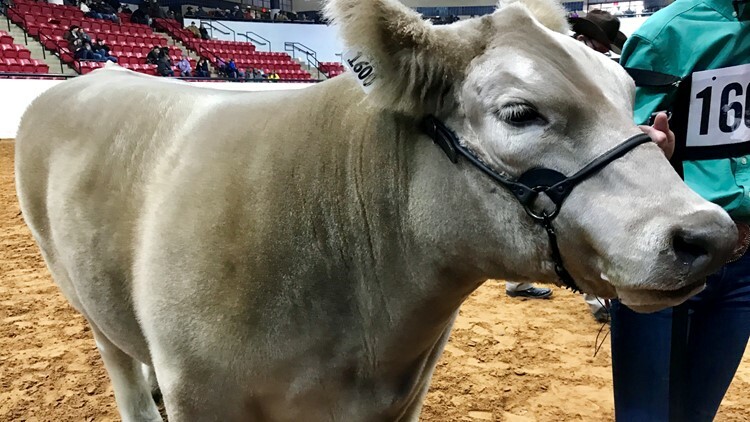 More than 1,000 steers were entered in the junior exhibition. Friday’s crowning of the grand champion is considered by many to be the most prestigious event at the Fort Worth Stock Show and Rodeo. The true slice of Texas was also a true representation of Texas girl power – about half of the exhibitors were girls. Judges closely examined each steer, making decisions based on things like looks and shape and how much meat was on their bones. In the end, Bentley, a two-year-old European crossbred, was named grand champion. Bentley had been raised since birth by 13-year-old Aven Horn from Abilene. The reserve grand champion was raised by a young woman from Hereford. Aven described Bentley as gentle as a lamb. Aven started showing Bentley last summer and said she’s worked hard to train him, but she said his disposition makes him special. She weighs about 105 pounds. Bentley is about 1,400 pounds. Yet she’s able to easily control him in the ring. The only time he acts up is “when he’s hungry,” Aven said. She won the San Antonio Stock Show two years ago with another steer and her brother is a previous Fort Worth Stock Show winner as well. Bentley, along with all the other steers in the show, will go on the auction block Saturday morning. “This is probably the hardest part, saying goodbye,” she said. The 2018 Grand Champion went for $200,000. Aven said she’ll use whatever money Bentley brings in to pay for college. She hopes to go to Texas A&M University and study agriculture.